I am so behind on writing about things I’ve been doing that this is going to be a very quick catch up. Leicester Comedy Festival on Tour. I particularly liked Pippa Evans although all the comedians were good. I love going to big name shows but the ones where there are a few people are great too. Especially as the comedy club at uni was how I got into live comedy originally and it reminds me of that. This video is of Pippa Evans (AKA Loretta Maine) singing I’m Fine. Totally cracks me up. Love love love love his live show. It’s the second time we’ve been and I was hard pressed to decide if I thought the first one (a couple of years ago) was better or this one. I think the general feeling between all four of us was the first one was better but personally it was hard to say. If you’ve ever seen him on Mock The Week you’ll know he’s a funny guy – well, his live show is much funnier. His bit about how a tour works is hilarious (tried to embed a video but couldn’t). And he did a bit about the NCT which was great but also had every woman in the room cringing, that totally just added to it. I will so be buying tickets to his next show. He did a warm up, pre tour gig at the arts centre. I think the best thing about that was that he was also supposed to go to Oxford soon but the very day we had tickets for it was annouced that as he’s got the One Show job his tour is delayed a year. So loads of local people have been bemoaning that fact but I got to see him!! He’s a really funny guy and I predict he’s gonna get bigger soon. The stories about his little brother were really funny. They were playing the best CD ever in the auditorium but couldn’t tell me what it is because it was his CD and I tweeted him but he didn’t reply. I absolutely adore Rocky Horror. This was the third time I’ve seen it and I really hope there’s a fourth before too long. In fact, the week it was on was half term and the usher mentioned that the tickets hadn’t sold well – and that there were loads left for the next (last) day. At that I was so tempted to see if they had a wheelchair space and go back but in the end I didn’t. This was also the dirtiest AP version of it I’ve seen I think. Although if I’m honest I can’t remember much about the AP from the first time I saw it in 2004. Definitely much dirtier that the one Mum and I saw in 2006. It made me very glad I was sat behind Mum not next to her as last time she kept not hearing the AP and asking me to repeat it. It was also the most dressed up I’ve ever been. I was finding glitter all over my wheelchair and everything else for days afterwards despite all the showers I had! 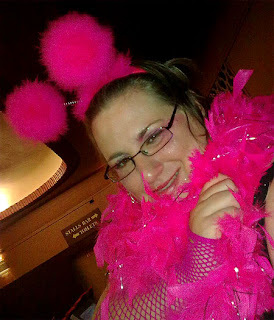 In this picture I’m wearing a bright pink feather boa, pink hairband with fluffy bopper things on (deely boppers?) and pink fishnet armlets (a bit like long gloves but without any finger bits at all). And when I saw these things were pink I mean really really HOT pink. I also had on a black strappy top and shorts although you can’t see those in the photo. Tonight we’re going to see Joseph! Woop Woop!